Diverting water off roads and driveways. 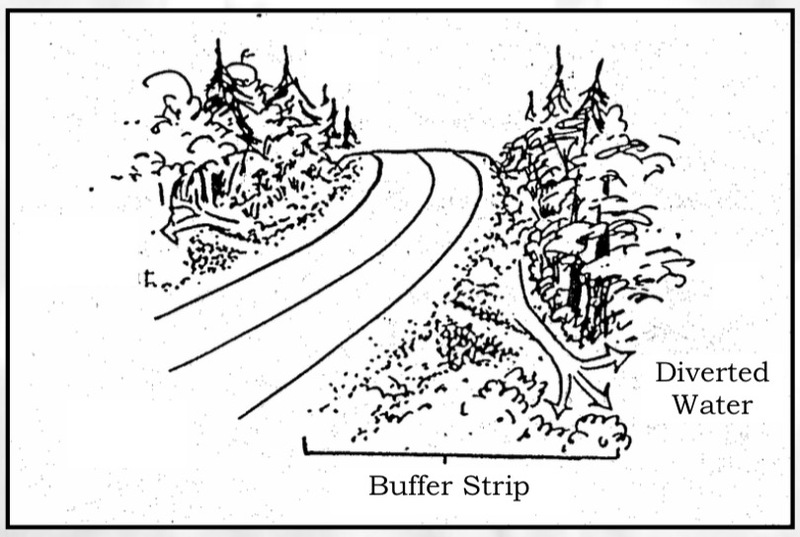 Purpose: Any camp road, even properly constructed ones, alter natural drainage patterns. On camp roads, the biggest concern is to get water off the road surface as quickly as possible. When surface water is not drained off the road, it can lead to washouts, muddy conditions, and potholes. 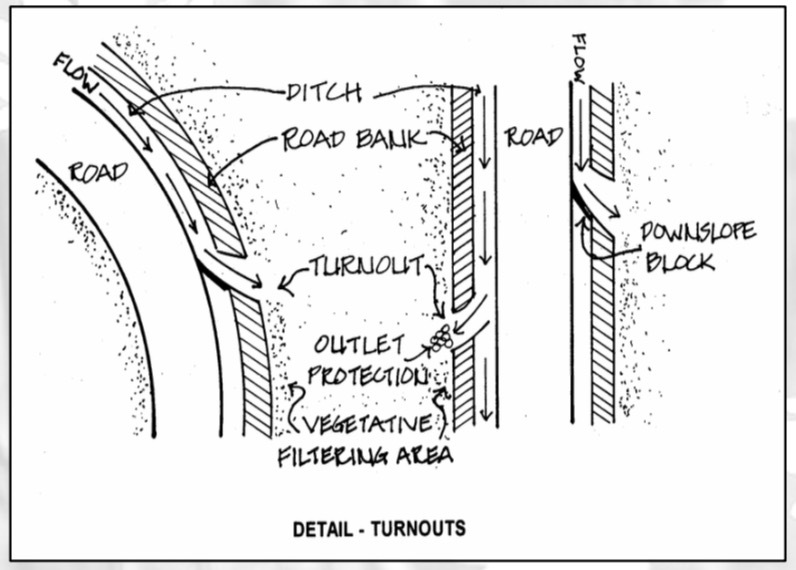 Turnouts return stormwater runoff as sheet flow to natural drainage areas. Often turnouts are simply extensions of ditches that redirect water into the woods and disperse runoff before it can cause erosion. Turnouts reduce the speed of runoff, allowing soil particles to settle out instead of being transported to a stream, river, or lake. Water and nutrients can then be filtered and absorbed by the surrounding vegetation. Installation: Turnouts are used to direct water away from the road into a vegetated buffer area, and can be constructed on paved or gravel roads with or without ditches. Turnouts can be the width of a backhoe bucket, a bulldozer blade, or a handheld shovel. Turnouts should intersect the ditch at the same depth, and gently slope down and away from the road. As it is easier to disperse smaller volumes of water at a time, turnouts should be constructed as often as possible. Ideally, turnouts should be placed every 50 feet. 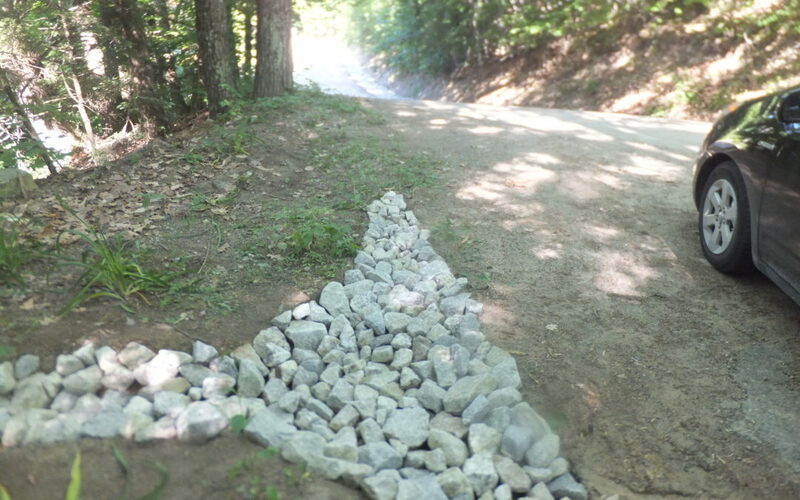 Utilize the natural contours of the land and install turnouts frequently enough to prevent large volumes of runoff from accumulating along the side of the road. Turnouts should be placed closer on steeper slopes. However, check with abutting property owners to ensure this water will not adversely impact their property. Turnouts should be stabilized so as not to create additional soil erosion. The turnout can be seeded and stabilized with hay mulch or erosion control blankets. Alternately, on steeper slopes or areas receiving greater flow, 3”-6” angular stone rip-rap placed over non- woven getotextile fabric can be used to line the structure. 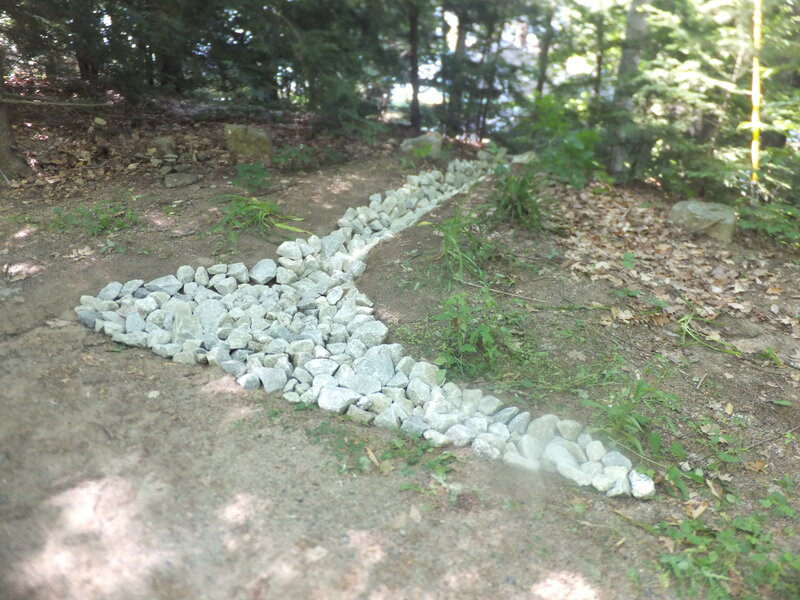 The turnout should have a flared end section that is level and lined with rock to spread out the flow. This level-lip spreader or rock dam converts the concentrated, channeled flow into slower, sheet flow just before it discharges into the vegetated area. Most importantly, do NOT outlet turnouts into existing stream channels or drainage ways! Materials: No special tools or equipment are required to construct turnouts. A backhoe, FrontRunner, or even a shovel can be used to build a turnout. As with ditches, turnouts must be stabilized to keep from causing further erosion problems as they discharge stormwater away from the road. Turnouts with less than a 5% slope can be seeded with a conservation mix and mulched with hay or an erosion control blanket until the seed germinates. 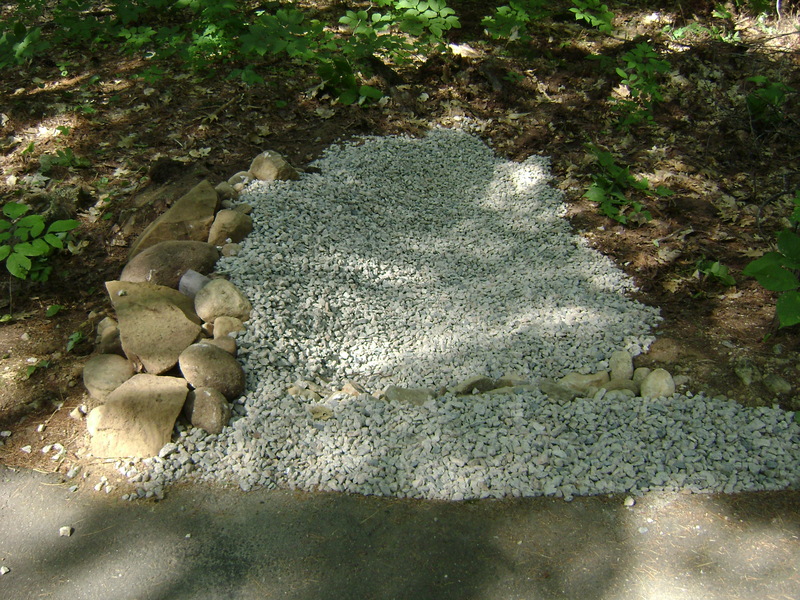 On steeper slopes, secure non-woven geotextile fabric on the soil and cover with 3”-6” stone rip-rap. Care needs to be taken on the outlet of the structure. It is vital that the channeled water be spread out and slowed so it does not erode the neighboring land. Turnouts should have a flared end section that is level and lined with rock to spread out the flow. Use 4”-6” crushed, angular stone for the outlet. Maintenance: Because the turnout may have a secondary function as a small sediment trap, maintenance is critical to ensure excessive sedimentation from storm events does not fill the structure and render it nonfunctional. Check turnouts during and after large storm events for erosion or accumulation of debris. Any turnout will fill with sediment over time, and it is critical to remove this material for the structure to function properly. Confirm that water flows evenly into the vegetation, and does not form an erosive channel. Shift stone, as needed, to stop any channelized flow. Have a post-storm plan in place for checking for damage and determining maintenance needs. Check out our technical assistance page to learn about getting a free erosion evaluation, and for more information on permitting. The Conservation Practices for Homeowners Factsheet Series are available at: Maine DEP or the Portland Water District. You can also find fact sheets at SOAK up the Rain NH.